I’m reporting on your challenge! I have taken your challenge and mostly been able to stick to it by using a stopwatch feature on my FitBit, and when I forget to hit the button, I guesstimated. I recently did a batik throw, measuring 48 x 41. (1968 square inches) Originally I was going to do an allover pattern but the quilt “spoke” to me so I ended up doing more creative things on it. Here are my statistics. At 0.4 cents per square inch, that invoiced out at $78.72, or $14.99 per hour for my time, which isn’t bad, but my “hourly” rate is $25, so this quilt either took too long or I am not charging enough. Basically it should have taken me three hours start to finish based on a $25/hour labor rate. No way could I have done this amount of work in that time, unless I had stuck to my original plan of an all over design. I have eight more quilts lined up to go so I will continue the challenge and see how things really are… It’s eye-opening! Here are some photos of the quilting Karyn did – Please click on the photos to enlarge the view. I left the photos large so that you can see the detail of the quilting. Karyn, I am glad to hear that you timed yourself when you were working on this quilt – which, by the way, is amazing! You did a fabulous job on the quilting! I agree, timing your work IS eye opening! When something like this happens to me, I call it a “learning experience” and I hope that I do LEARN something from it. I think all quilters, at one time or another, have had a quilt “speak” to them and they change the original quilting designs to something else. It always seems that the change(s) will take more time and be more detailed quilting. All of these changes are assumed to fall under the “do whatever you want / quilt as desired” statement and documented on the worksheet and approved by the quilt’s owner. 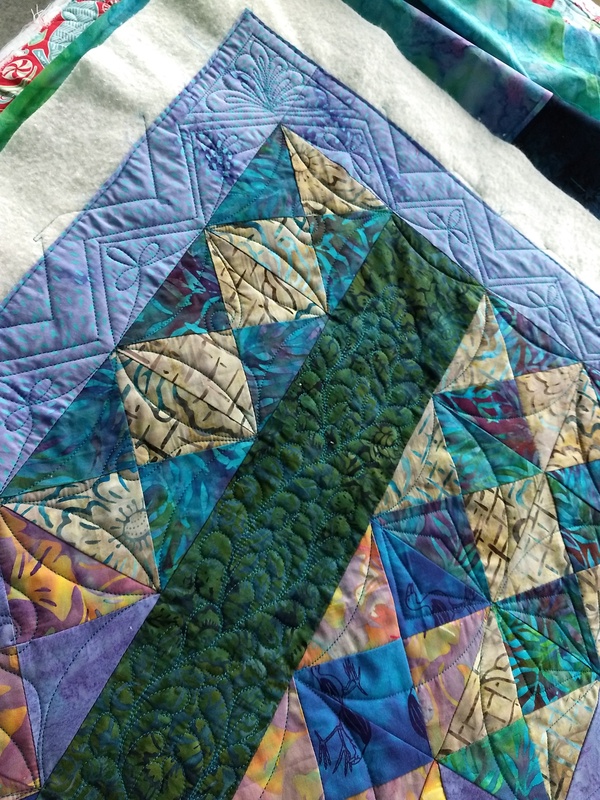 Personally, if I choose to quilt a more complex, detailed design, then I “absorb” the extra time and the (potential) loss of the extra quilting $$. I will still keep track of the quilting time involved so that the next time I use that technique, pattern, template, etc., I will be able to give a more accurate estimate due to the extra time involved when using that technique, pattern, template, etc., on the next quilt. Let’s say you are intaking a quilt and the customer says, “I really like what you did on so-and-so’s quilt, (or seen on another quilt someplace else) can you do it on my quilt?” You know what pattern / design / technique that she is talking about and you know that it will take longer to complete. Or, you suggest a pattern / technique / template, etc., and you KNOW that it will take more time to complete. Whatever the scenario, in your mind, figure out how many extra hours it will take – then by all means, ADD extra $$ to what you will charge to cover the extra time it will take to for you to complete the quilt! Going back to my contractor example from a few posts ago – if you were working with a contractor on a home improvement and you wanted to add something that would take more time and effort for the contractor to do, wouldn’t the contractor charge extra for this? Then why shouldn’t you, as a “quilting contractor” do the same thing. Recently, I was working on a customer quilt and I came up with a new border design using one of my templates. I knew it was going to take more time, but I didn’t know HOW much extra time it would actually take. My choice was to go ahead and use the new design and assume it would take extra time to quilt. The quilt was 96 x 96 inches and I estimated about 2 hours for the (original design) border quilting. The actual quilting time for the border, using the new design, was 4 hours! This was a “learning experience” for me (one of many.) If I use that design again, my choice would be to add extra $$$ – a lot of extra $$$ – to my fee! OR, I can do less intense quilting in the body of the quilt (less time) and the more intense border quilting (more time) and between the two, they would equal the time for a “normal” quilt, which I would charge accordingly. I know, this is all as clear as mud!! I know that I will look at a smaller quilt and think “if I do this more complex, time consuming technique /pattern, template, etc., it won’t take THAT long!” Guess what? Most of the time it does take longer (sometimes a lot longer) to finish! With a small quilt, I will generally over estimate the time / cost of the quilting. If it takes significantly less time to quilt, I can always reduce the price of the quilting, which makes my customer happy. But if it takes longer to quilt, then at least I have some $$ for my time and effort. Having these “learning experiences” is how we learn what techniques take more time, and on the flip side, which techniques take less time to quilt! By timing your work, over time, you should get a bunch of averages. You should get an average amount of quilting time on a quilt, which you can break down to Queen size, King size, etc. You should also get an average price for your quilting, which you can, again, break down to techniques, such as average price for template work, free hand work, pantographs, etc. From all of this, over time, you will be able to figure out if you are really making any $$ with your quilting! Yes, I know we all are having way too much fun quilting, but, if you are quilting as a business – and many of you are quilting as your main source of income – then you NEED to KNOW all this information and you need to KNOW if you are making any $$. As always, I welcome your comments and I hope to hear from more of you about your results from timing your work. Post any comments in the comments box or if you would like to contact me personally, send me an email at longarmu@aol.com. I belong to a couple of online quilting groups and recently someone had posted that they had accidentally ripped a hole in a quilt they were working on. They were rolling up the quilt with the needle in the down position, the machine caught on something and BAM!! there was a small rip on the quilt top! In this situation, it turns out it was the quilters own quilt and she was able to fix it. But ….., what if this was a customer quilt? What would you do? As professional quilters, we all do our best to complete our customer’s quilts. But stuff happens and we have to deal with it. Just as above, you are working on a customer quilt. Somehow, you make a small rip, let’s say less than 1 inch long, in the quilt top. Let’s say it’s in the middle of the side border on a fairly floral fabric. After you get finished crying and yelling at yourself, how would you deal with this situation. Or, if you have had this happen to you, how did you deal with it. Would you contact the customer after it happened or wait until the quilt gets picked up? Or not tell them at all? Would you fix the rip (I would use some fusible under the rip, then some Fray Check on the ragged edges and possibly slightly alter my quilting in that area to stitch over the rip) or have your customer fix it herself after she picks it up? If you fix the quilt and the repair is not noticeable, do you tell your customer about it or not? Would you give your customer a discount on the quilting fee or a discount on future quilting? Or not? Just for fun, let’s have another scenario. This time the rip is more in the middle of the quilt top, in a noticeable area, maybe on a darker fabric and the light batting is showing through. What would you do and how would you deal with this? Here is another thing to think about, what were you doing that created the rip in the quilt? If it is something that you have some control over, can you avoid doing it in the future? For me personally, I avoid like the plague moving the quilt with the needle down. I know, a lot of you were taught to do this to line up patterns, pantographs, etc., but there are ways to move your quilt without the needle down. And yes, I have ripped a hole in a few quilts over the many years of my quilting. My choice is to fix the hole the best I can, complete the quilting, tell the customer about it when the quilt gets picked up and, if the repair is somewhat noticeable, I will give a discount. My last experience like this was about a year ago – I ripped a small hole in the backing fabric when I was taking out some stitches in an area very close to the raw edge of the quilt. I fused matching fabric over the hole and quilted over the fused fabric. I did tell my customer and, since it was such a small area, I did not charge her for the thread I used in her (super sized) quilt! I look forward to reading about your experiences and your thoughts on this. Many professional machine quilters give discounts to their customers. These discounts are usually about 10 – 20%, sometimes more, and can be for a variety of reasons – new customer discount, returning customer discount, sunny day discount, rainy day discount, showing up at the door discount, etc. Personally, I don’t give discounts. I feel that you loose way too any $$ with discounts. Let’s run some numbers. Example – Queen Size Quilt, moderate density quilting, it doesn’t matter if the quilting is free hand, pantograph or computerized. If you charge $250 for this quilt, with a 10% discount ($25) your charge (to the customer) would be$225, with a 15% discount ($37.50) your charge is $212.50, with a 20% discount ($50) your charge would be $200. Note: If you would charge a different amount, your numbers would be different. Again, some numbers – The Queen Size quilt in our example above took 6 hours to complete. At full price of $250 divided by 6 (hours) = $41.66 per hour. For the discounted prices, $225 divided by 6 = $37.50 ph, $212.50 divided by 6 = $35.41 ph and $200 divided by 6 =$33.33 ph. At full price of $300 divided by 6 (hours) = $50 per hour. For the discounted prices, $270 divided by 6 = $45 ph, $256 divided by 6 = $42.66 ph and $240 divided by 6 =$40 ph. Note: NO operating expenses or self employment taxes have been taken out of the cost per hour amount. You can see that the amount of $$ you are making per hour decreases significantly with each discount given. Before we go any further, I want you to think about your customers. I would be willing to bet that most of your customers do not come to you ONLY because you offer a discount. Your customers come to you because they like your style of quilting, the quality of your quilting, your personality, your lifestyle, etc. Price usually isn’t at the top of their list when looking for a machine quilter. OK, I do know that there are some people where price is the ONLY thing they look for in a quilter. Fortunately, these people are mostly few and far between and YOU get to choose if you want to work with them. Personally, if someone comes to me and wants me to quilt “cheap”, I just tell them – nicely – that I don’t do cheap quilting and it may be better for them to take their quilt someplace else. And yes, I have had to do this a few times in my machine quilting career. So, if price is NOT the only reason your customer is coming to you, and if you routinely give them discounts, why? You may want to re-think your motivation behind your discount philosophy. But, you want to give your customer an incentive to return to you, or you want to reward them in some way. I suggest that you offer them FREE BATTING. Batting is tangible. Your customer KNOWS what batting is and knows what the approximate retail cost of batting. Free batting also saves your customer time by not having to stop by the quilt shop and they may be able to bring their quilt to you more quickly. Best of all, by offering the batting FREE, your customer knows they are getting a great deal. Note: Batting should be a separate charge and not included in the price of the quilting labor. Here is the best part for you, the machine quilter. Free batting will cost you less than most discounts! You need to purchase your batting wholesale or at a discount. A Warm & Natural Queen Size batting, pre-cut, wholesale is $16.30 (Price at EE Schenck, Portland, OR, May 2014.) The suggested retail price would be $32.95 +/- Prices will vary for other battings and sizes or if purchased/sold by the yard. For a $16 (+/-) investment, you don’t loose any $$ on the quilting labor that you would charge to your customer. This means that there is more $$ in YOUR pocket! I am a Longarm quilter from an East Coast state. I was looking at your prices and was wondering if every quilt you do is custom quilted? Where I am, they want the cheapest thing I do which is meandering. They make a beautiful quilt (or not) but want it quilted as cheaply as possible. 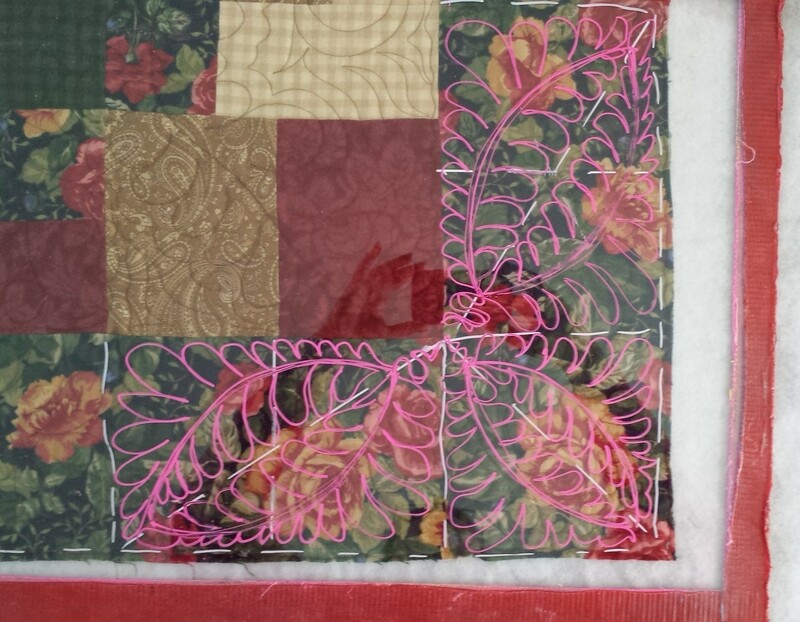 It is very seldom I custom quilt a customer’s quilt or a even do a pantograph. I know I am much cheaper than other quilters in my area but figure this is a fair price since meandering (a big stipple) takes very little time compared to pantographs. (Sometimes that is all I can do to a quilt because it is so out of kilter.) Was wondering how you get them to want something besides the cheapest thing. I have been doing this (longarm quilting) for about 8 years now and as a part time business for about 6 years. There are so many longarmer’s in this area, it is not a full time business option. Thanks for your help. I did write back to this person and told her to call me and we could talk about this. At this time, I have not heard anything from her. The more I thought about this email, the more I felt that the answers I would give to her are valuable information for other quilters. This one email is going to be the basis for a series of blog posts. If you are the person who wrote this email, please call me. I included my phone number in my email back to you. To answer the questions about my quilting business – Yes, most of the quilts I do for my customers are custom quilted. (Here is my brochure in a pdf file Cindy Roth Quilter Brochure 2013) I occasionally do a pantograph although I do prefer all over free hand designs (AOFHD). The AOFHD many times are much easier and quicker to do than pantographs, which means I can make more $$ for the time I am working on a quilt. An important thing to remember is, even though AOFHD’s and pantographs may be relatively easy and fairly quick to do, I DO NOT price them significantly LOWER than my custom quilting prices. In fact, I price them the SAME as my lower end custom quilting prices. There is just as much skill involved in quilting all over designs and pantographs as there is in custom quilting! In my very un-humble opinion, a well done pantograph is better than poorly done custom quilting. And, not all quilts require custom quilting. Personally, I don’t do “meander” – all over or otherwise – and I don’t do “regular” stippling. There is SO much more “out there” that can be done on a quilt top. I do several variations of stippling, including Ribbon Stipple and Landscape Stipple. (For a free video class on how I do these patterns Click Here) If a customer came to me and insisted that I ONLY do all over meandering on their quilt, I would probably refuse the job. Nicely, of course. Then this leads to the second question – How can I charge more? The easy answer is – because you are doing something DIFFERENT, you can charge differently! By that, I mean charge more $$!! *Overall design is quilted free hand all over the quilt. **Pantograph – .02 – .04 cents per square inch, depending on complexity of design. Here is another question for you – If you are not going to do meandering any more, or on a very, very limited basis, why have it on your price list? I would recommend TOTALLY ELIMINATING the lowest price you charge. (Has anyone fainted yet?) If the lowest price is NOT seen or posted, then how can you charge it or have your customers ask for it? I would also change the wording of the above prices. For “Pantograph” I would change it to “All Over Quilting – either free hand or from pantographs, starting at 2 ½ (or better yet) 3 cents per square inch.” Don’t specify if the pattern is free hand or from a paper pattern. The customer usually doesn’t know the difference and really doesn’t care. In one fell swoop, you have eliminated the meander and raised your prices. This is a win, win for you, and ultimately, for your customer. If a customer absolutely insisted on all over meander, (and if I accepted the job) I would still charge it at my new “all over” price. If they resist, then I would highly recommend/insist they have a different pattern than meander or refuse the job. I know, that is a lot easier said than done, but, believe me, I have “been there and done that.” It does take some (a lot of) backbone and a couple of deep breaths and to do this the first time or two, but, with practice, it DOES become easier. You will begin to see that your quilting is looking much better on your customer’s quilts (not to mention eliminating the boredom factor) and you are beginning to see more $$$ for your quilting. And that’s a very good thing! Soon I’ll write more about the other things in this email. Your thoughts and comments are welcomed and appreciated. Leave a comment, I know that we all want to know what you are thinking! In the last post, I had a new quilter asking how to get customers for her business, other than joining the local quilt guild. I asked for comments from you all on how you get customers and there were many excellent responses. Thank you all so much for your suggestions and input! Here are some of my thoughts about getting new customers. If your guild has a quilt show, see if you can rent a vendor booth so you can show your quilting skills to other quilters who are visiting the show. You may even have a “prize” of a big quilting discount, free batting, fat quarters, etc., if they leave their name and contact information – which you can use in your future business mailings. Talk to the local piecing teachers. Contact the (piecing) teachers directly about quilting their quilts. You may want to offer a special discount to the teachers. Remember, most teachers teach at several different quilt shops and show their quilts (that you quilted) to many different people in different areas. You can mail a flyer and/or coupons to the teacher if you know their address or possibly call or email them – again, if you have their contact information. You may even want to think about taking some piecing classes. You can talk directly with the teacher and the other students in the class. Don’t do a “hard sell” but bring some of your quilting to the class for Show & Tell. Join a Block of the Month (or similar) at your local quilt shop. Many quilt shops have a “Free” or a “$5 Quilt” program where, once a month, you come to the shop for a quilt block pattern. There is usually a free class you must attend and then you pick up your the next month’s pattern. Even if you don’t like the quilt that is being offered, bring a completed small project – tote bag, baby quilt, quilted vest, etc. – of course quilted and bound, using the previous months pattern provided by the shop. Bring business cards/brochures, but again, don’t do the hard sell. Just show your “stuff” and leave some business cards. When you get business from your class mates, you can offer to bring the competed (customer) quilts to the class to be picked up – and shown it off to the class! Have your customer drop off their quilt during their vacation and then send it back to them after it is completed. Make sure to add return shipping charges to your fee. Have your customer send their quilt to you before their vacation. You can quilt it and have it ready to pick up during their vacation. Have your customer drop off their quilt at the beginning of their vacation and you quilt it while they are on vacation. They can pick it up when their vacation is over. (Because this is a “sort of rush” quilting, I may charge a little bit extra for this service. ) This may add extra pressure to you, but, think of the convenience for the customer. If you were the customer, would you tell your friends about how quickly the quilt was finished? I sure would! Unfortunately, I can’t tell you exactly how to contact the “out of area” quilters. I am sure that, with a bit of thought, you can figure out how to do this. Market to quilters who are a (farther) distance from you. You may want to think of going to quilt shops, guilds, etc., in other cities/towns in your area. Again, you are going to have to figure out how to do this, but, with the shipping resources available (USPS, UPS, Fed Ex, etc.) quilts can come to you from all over! If you can think of more ideas on how to get new customers, please leave a comment. Click on the “Leave a Comment” button at the top of this post. I have been at this quilting for over 5 years and I have had my share of disastrous quilts. My question is: Is it more important to keep a quilt square around the edges or to build in the puffiness that is created from piecing, possible pulling an on point quilt, or maybe pulling the borders too tight with an on point quilt? I am very conscientious with the customer who is a meticulous piecer, it is easy to spot problems and I try my best to keep the quilt square, straight, and work as hard as they worked to in their piecing. But, when you get a quilt that has strings hanging all over, not ironed that well, and is definitely not square, borders are a mess, what do you do? Question #1 – Is there a reasonable amount of time that should be spent on making the quilt the best as possible? Question #2 – Should we throw out any idea of square along the edges, is flat more important? 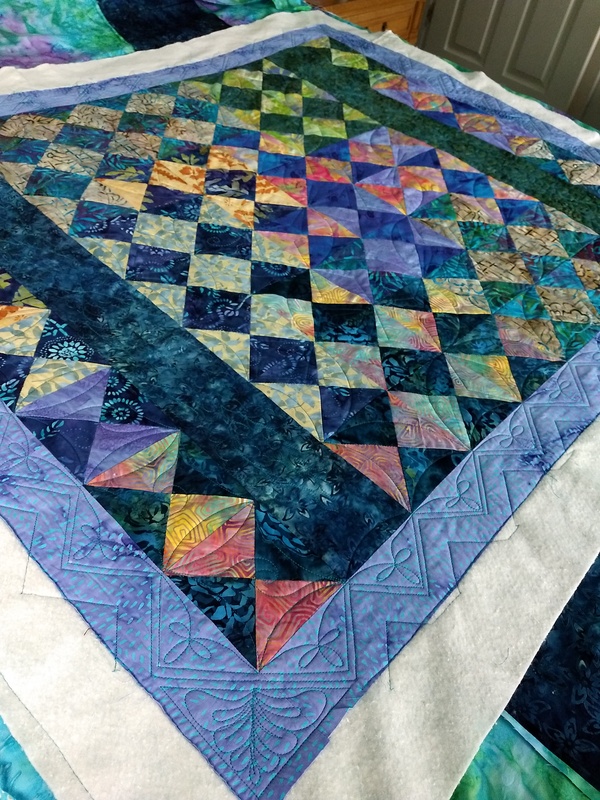 Question #3 – Does the customer really appreciate the time used to make her quilt wonderful? I do try to trim loose threads and iron any major creases; I have an iron station that is set up to handle un-ironed backings, so I do take on piecing and ironing imperfections, charging of course for the process. 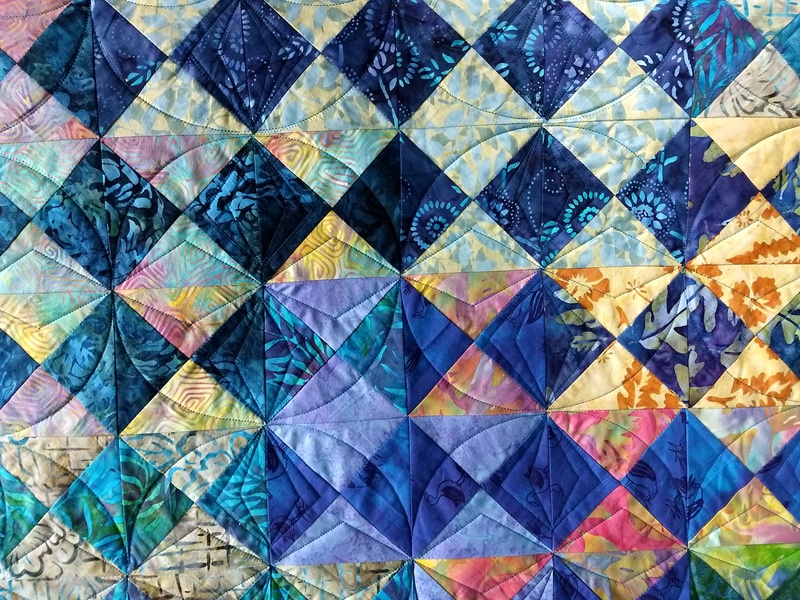 Many of my friends do not feel this process is necessary, but I find that it makes my job easier – I find a lot of piecing mistakes during this process and it gives me a clue if the quilt is going to have issues. This has been my dilemma for years, I have recently been basting my quilts completely, before starting the quilting process. This does help give me some idea of what I am actually tackling or fussing with such as creases, puckers, extra fabric, or the notorious wavy, wobbly, puffy border. Now it is your turn – what would you do, or what do you do in this type of situation? I know that this is an issue that we all struggle with and I would really like to know what you think. I will post my response to Stephanie in a little bit.